I don’t like candy. There. I’ve said it. Halloween blasphemy, I know. But to my palate, candy’s not much more than cloying sweetness in every tooth-decaying bite. But before you cross my house off your kid’s trick-or-treat list, I’ve learned my lesson. I know that if I put apples or toothbrushes into their goodie bag, I’ll be branded “old lady Lampman”, and deprived of admiring your child’s darling costume for years to come. I don’t want that to happen. Halloween is all about costumes and candy, and I love the holiday for it. I’m not a trick-or-treat Scrooge, turning my house lights off, hiding in the basement until the munchkins retreat. I decorate with jack-o-lanterns and goblins and go hog-wild purchasing the best candy bars I can find. I’m not stingy either, bestowing one puny little treat per child. I toss fistfuls into bags with abandonment (and as further guarantee I won’t awaken to eggs smashed across my garage door the next morning). I just don’t like candy. But I do like muffins, and options abound for making muffins festive to the season that my husband — and even children — enjoy. I’m not referring to sugar-laden, white-flour cupcakes that call themselves muffins. I resent those tricked-out poseurs; those fluffed-up hussies who think just because they are sprinkled with brown sugar and nuts, they can call themselves a muffin. Cupcakes are perfect for special occasions and moments of whimsy, but call yourself a cupcake, because that’s who you are! To me, a good muffin has substance, texture and ambition; every whole grain bite anxious to provide sustenance and slow-burning energy. I like them sweet, but not too sweet. 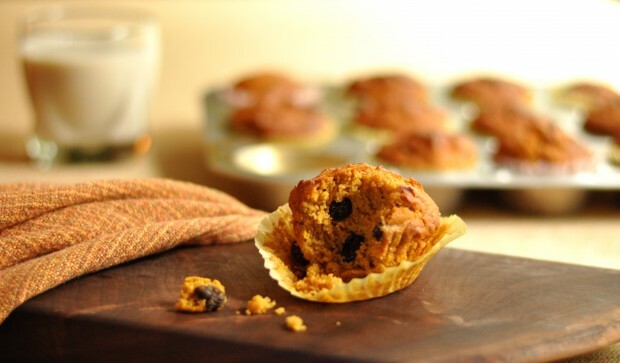 I prefer a modest, old-fashioned muffin — not oversized, as if it were pumped up on steroids. A toddler should be able to cradle a muffin in her hand. Baking muffins is different than, for instance, baking breads or cake. Muffins are forgiving and don’t insist you follow each step to the letter. In the recipe below, you could skip the ginger and substitute with a combination of allspice, nutmeg and cinnamon. 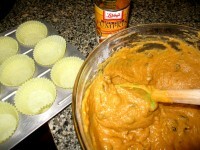 Or substitute smashed ripe banana or pureed sweet potato for the pumpkin. Toss shredded carrots, coconut or chopped nuts, into the batter. Create combinations of flax, buckwheat, cornmeal or oatmeal in lieu of the flour. Using a cup of sugar in the recipe below yields 1 tablespoon of sugar per muffin, which can be modified according to your taste. The muffin prefers, nay — insists — you have it your way. There was a time that candy was my passion and Halloween, my favorite occasion. The early 60s found me a beatnik, mid-60s transformed me into Twiggy, and by the late 60s, I’d morphed into my idol, George Harrison (we shared a remarkable resemblance). My brothers dressed as ghouls and our dog, wearing red-satin and horns, accompanied us as we ransacked a five-mile radius of our home. My free-spirited mother never rationed the booty, so the first days of November found me a burnt-out junkie — 24/7 — guarding my stash on a jittery, glassy-eyed high, until keeling over in a sugar stupor. But as the years passed, the crash was more brutal, and my cravings waned, trickling — at last — into nothingness. Life sometimes teaches lessons the hard way. And (barring allergies or other dietary restrictions) to deny candy on Halloween, could create a life-long addiction, cane wobbling as it points toward the candy aisle. Grease muffin tins or add paper liners. In one large bowl combine flour, baking powder, baking soda, salt and 1/2 cup white sugar and brown sugar. In another large bowl, whisk together eggs, pumpkin, water and oil. Stir in raisins and crystallized ginger. Fold wet mixture into the dry; stir until combined. Taste mixture and add additional sugar if desired. Spoon into muffin cups filling them just before the top. Bake 25-30 minutes or until golden brown.